Skyscanner is a one of the popular search engines for flights available under “travel” category of its App Store. It lets you search flights on Windows 8. This Windows 8 Skyscanner app lets you search for best and the cheapest flight available between the desired destination. You can easily search the availability of flights between the departure and return date i.e. round trip. Also, this app to search flights on Windows 8 lets you search flights according to the number of passengers travelling. Just select the number of adults and children and the app will show you the prices of the tickets accordingly. At first login, the Windows 8 Skyscanner app will ask you for your location. Just allow it to track your location so that it becomes easy for it to locate the cheapest flights available in your city. Well, not only this, the Skyscanner Windows 8 app even provides you some other smart options. While searching the flights between the locations, it displays number of travel agents from which you can select and book the tickets. One of the good parts of this Windows 8 Skyscanner app is its filter option. The list can be filtered according to their stoppage, duration, times, airlines, and airports. While searching the flights between the preferred destination, this Windows 8 Skyscanner app gives you a long list of flights to select from. To make it easy, you can easily sort the list by multiple platforms. Sort the list by carrier, take off, landing, stops, and duration. This sorting can be done on both the list of flights which include outbound and return. With this you can easily select the best and the cheapest flight available between your preferred locations. Skyscanner app is specialized in searching the best flights available. But, you can also book the tickets via Skyscanner. To book the ticket, just select the preferred locations (From and To), select the number of passengers (adults and children), select the departure and return date, and click on search button. Now, the app will take you to the page where you will find the long list of flights. 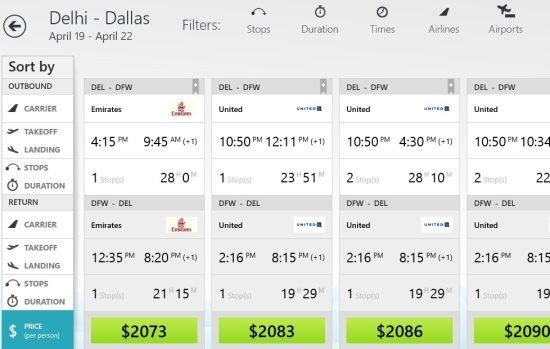 Select the flight and click on “book now” button. It will then direct you to your default system browser. From there, you can easily go ahead and book the flight tickets. Search for best and the cheapest flight. Smart sorting feature to sort the list of flights. Filter the list of flights according to stops, duration, time, airlines, and airport. Automatically calculates the total amount according to the number of passengers selected. Displays the duration of flights. Automatically reads your current locations and gives you the cheapest list of flights available in your city. Pin any flight to your Windows 8 start menu. The app is available in more than 20 languages. Skyscanner, no doubt is an awesome flight searching Windows 8 app. But, there was a feature which I was missing. After searching the flights, the app should give an option to email the details to anybody or our self. But, I did not find the option to do the same. However, the app developers says that it provides the feature to email the flight details, but unfortunately I did not find any option like that. Also, check out our posts on Apps to Book Hotels, and Travel Guide Apps. 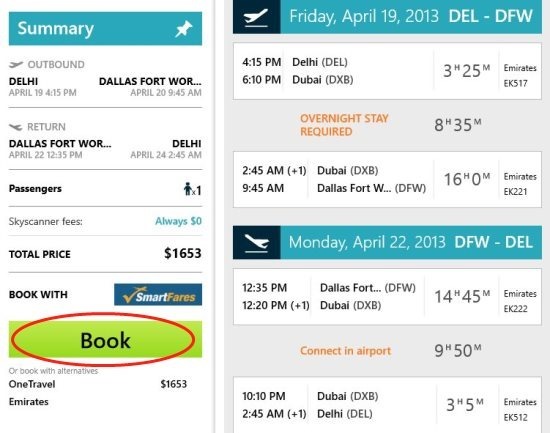 To download it, just head to your Windows 8 App Store and search for “Skyscanner” app. Else, simply open the link in IE10 and click on ‘View in Windows Store’. Now, click on install button and you are all set to enjoy the free app. Before folding up the article, I would just say that this Windows 8 Skyscanner app just rocks. It makes flight searching task, an easier one on Windows 8 PC. I like the sorting and filtering part of the app. Also, I like user interface which can be easily used by anyone. Moreover, if you have Android smartphone or tablet, then you can download Skyscanner app for Android. It also provides its online service for users. Just install and enjoy.